Identification tags, or dog tags as they are commonly called, are issued to all members of the armed forces in sets of two as a means to identify the dead and wounded, and to provide basic medical information for the treatment of the wounded. In the armed forces of today, dogs tags are of one standard pattern. However that was not always the case. During World War II, the dog tags worn by members of the Marine Corps, Navy, Coast Guard, and the Merchant Marine were much different than those worn by their counterparts serving in the Army and Army Air Force. Initially, dog tags of the for all branches of the armed services were fabricated from a trademarked alloy called "Monel." Monel was produced by the Special Metals Corporation and was composed of up to 67-percent nickel, with the remainder consisting of copper, iron, and manganese. Due to the rapid mobilization of personnel into the armed forces and the increased production in war materiel that followed the attack on Pearl Harbor, shortages of metals soon developed. As a result of these shortages, the supplier simply could not keep up with the demand for dog tag blanks fabricated of Monel. The armed forces solved this problem by utilizing either brass or stainless steel in the fabrication of dog tags—a practice that continued throughout the remainder of the war. 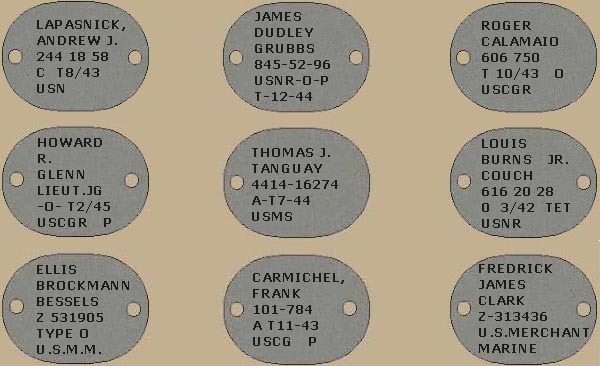 Dog tags of the naval service had a distinct oval shape. Whereas dog tags of the Army and Army Air Force resembled the modern day shape, those used by the Marine Corps, Navy, Coast Guard, and the Merchant Marine were oval in appearance. Dog tags of the naval service were of two basic patterns, both measuring 1.50-inches by 1.25-inches. These tags differed only by the number of holes for the dog tag chain—the P1917 pattern having one hole, and the P1940 pattern having two. Both of these patterns were used throughout the entire war, fabricated in one of the metals previously described. Both of these patterns are illustrated below. The method of imprinting the personal information on the dog tag blanks was entirely different than the debossing process used by the Army and Army Air Force. Imprinting personal information on the dog tags of members of the naval service involved a process known as "indenting." 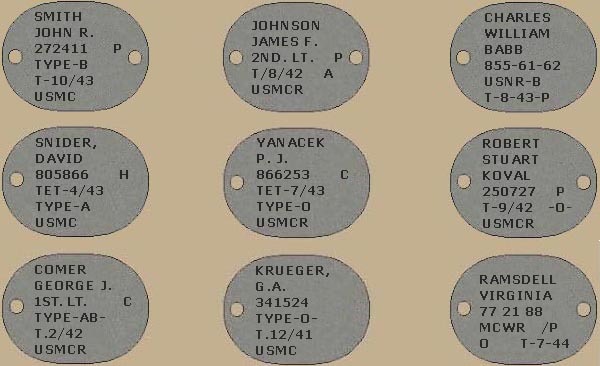 This process stamped the personal data onto the dog tag blank in a manner that the reverse side of the completed dog tag remained smooth with virtually no evidence of the lettering on the front side of the tag. This process was accomplished by modifying a standard graphotype machine by removing the lower set of dies and machining a flat-bottomed fixture to hold the tag in place while it was being stamped. Now that you have a better understanding about the dog tags utilized by the naval service during the Second World War, a number of additional questions often arise. We will now discuss some of these typical issues. According to the naval regulations that were in force at the beginning of the war, each man's fingerprint was required to be etched to the unmarked side of each tag. The process involved applying the fingerprint with printer's ink, then sprinkling the area with finely powdered glisonite or asphaltum which would adhere to the ink. Once the ink had dried, the excess powder was removed by simply blowing it off. The dog tag was then heated to a temperature slightly above the boiling point of water and permitted to cool before being placed into a solution of nitric acid, hydrochloric acid, and water for a period of one hour. Upon completion of this process, the dog tag was dried and was now imprinted with the wearer's fingerprint. This requirement was discontinued at the end of January 1943. ● Branch and component of service (USMC, USMCR, USMCWR, MCWR, USN, USNR, USNWR, USCG, USCGR, USMS, USMM, and others). Below are nine examples which illustrate some of the formats used during the war. For an understanding of the use and assignment of service numbers, a link to articles discussing this is provided on our links page. We hope that this information provided you with a basic understanding of the dog tags worn by members of the Marine Corps, Navy, Coast Guard, and the Merchant Marine during the Second World War. For those who may be interested in ordering a pair of our Navy and Marine Corps-pattern dog tag reproductions, we stand ready to assist you and encourage you to examine our products. Please note that we do not offer reproduction dog tags in the pattern used by the Army and Army Air Force during World War II. However, you may learn more about them and purchase a reproduction set on-line from one of our preferred vendors at the link below.